New ListingCable (Vol 1) #68, 69 (1993) NM High Grade! 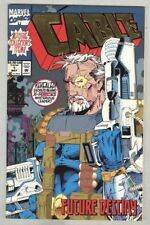 Cable #1 (1993); 1: Sinsear; Clan Chosen; High Grade! 6 product ratings - Cable #1 (1993); 1: Sinsear; Clan Chosen; High Grade! Cable 1, NM- (9.2) 1993 unread File Copy! 50% off Guide! This page was last updated: 25-Apr 07:37. Number of bids and bid amounts may be slightly out of date. See each listing for international shipping options and costs.